These are free to download AutoCAD Blocks. These files has been saved in AutoCAD 2006. Our drafting details will be useful in any DWG compatible CAD software package. Have you tried BricsCAD, Chief Architect, DesignCAD 3D Max, DraftSight, LibreCAD, Microstation PowerDraft, nanoCAD,ProgeCAD, Sketchup, Solidworks, TurboCAD, Vectorworks and ZWCAD? Click on the link below to see an image preview of the file and to download the CAD block. 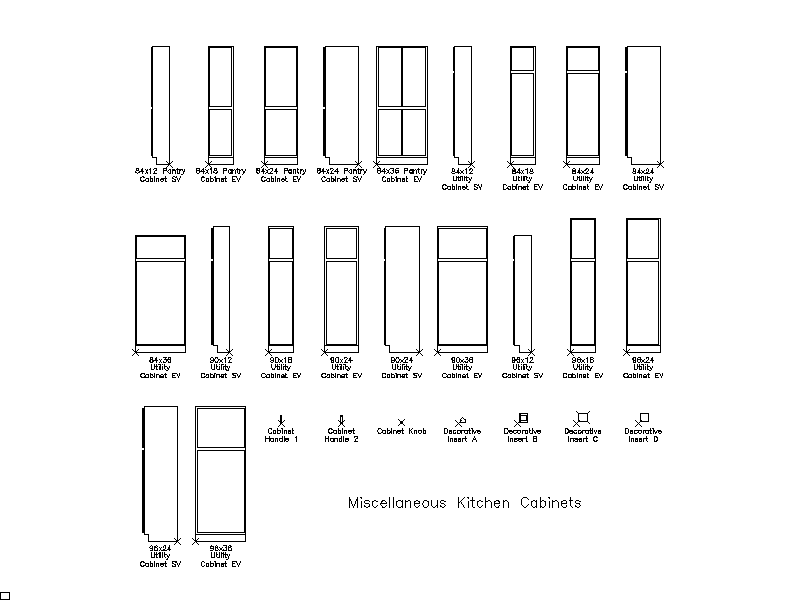 Description : Miscellaneous kitchen cabinets. Cad Corner provides these blocks "as is" and with all faults. Cad Corner specifically disclaims any implied warranty of merchantability or fitness for a particular use. cad corner does not warrant that the use of these blocks will be to the users specifications or error free, the end user takes responsibility of editing the block to their local standards. use at your own risk.